This month, August 2013, brings us to the fifth anniversary of Synchronized Chaos International Magazine. We celebrate with all of you, and thank those who have worked hard to keep this publication alive. This month, the works submitted suggest a collection of artistic renderings, either literally or by applying the concept to other areas of experience. An artistic rendering involves reproducing something very accurately, paying attention to light, shadow, shape and proportion. This might seem more technical than artistic, but sometimes we need to understand what’s going on before we can start to interpret and react to it. UC Berkeley astronomer Dr. Mate Adamkovics presents a complex picture of weather and climate on Saturn’s moon Titan, extrapolated from data from the Cassini mission and other recent observations. Using mathematical models, we can determine quite a lot of information from just a few empirical details. 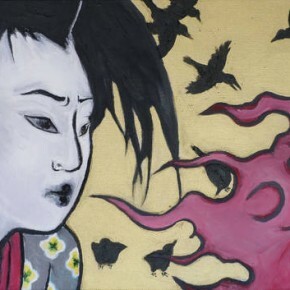 Neuroscience columnist Leena Prasad does something similar, turning brain anatomy comparisons into a narrative about creativity, as expressed by a painter and his wife. And Evelyn Posamienter renders X-ray images of human brains into a series of formal poems, her Brainiography, suggesting the scientific precision of the medical examinations, but also the humanity of her protagonist, who reflects upon naivete, curiosity, and a changed life due to disability. Painter Courtney Thiesen describes much the same thing as she outlines her mental process in generating work. She notices interesting objects around her and feelings she has, and lets them percolate in her mind and ultimately take shape as a completed portrait or scene. Poet and novelist Christopher Bernard looks at a finished painting, Haymaking by Jules Bastien-Lepage, and probes how much we can know about the character and the scene just by viewing the work, and how much is left a mystery. Elizabeth Hughes examines a whole series of titles in her Book Periscope column (Sondra Sneed’s What to Do When You’re Dead, Gary Huerta’s Divorce: A Survival Guide for Men, Evelyn Posamienter’s Poland at the Door, Ekaterina Gaidouk’s The Adventures of Chi-Chi the Chinchilla, Mindy Mitchell and Edward Land’s Lube of Life, Taquila Thompson’s Hood Wolves, and Dean Hartwell’s St. Peter’s Choice). This month’s authors don’t shy away from the ‘big questions,’ tackling religious faith and doubt, gender relations and marriage, and urban crime and poverty. They also point to new and expanded life possibilities for seniors as we live longer, and illustrate life lessons for children in complex and unique ways. These books show how we can rise to deal with our challenges by re-thinking matters. Whether by discovering healing through faith, rejecting limiting dogmas or expectations for your age or cultural groups, rendering history and tragedy into art, or choosing to respond to difficult circumstances with compassion and patience. Travel writing represents another way to capture and synthesize experience. Rui Carvalho’s Text from Portugal and Lukas Clark-Memler’s final memoir chapter show us Lisbon, Portugal and the island of Borneo in a way that lets us actually see the destinations, rather than focusing on the author’s internal psychology. 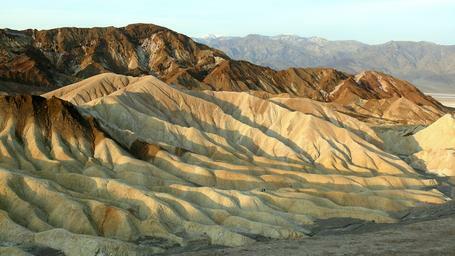 We are thus able to learn about these places and visualize them through photos. While reading some popular memoirs, people can be tempted to cry out, ‘Author! Periscope Up, Mirror Down!’ in order to refocus the travel narrative onto the outside world. While some travel writers can effectively balance internal and external journeys, it can be good to have the chance to see a different place for what it is before bringing interpretations to the scene, and Carvalho and Clark-Memler allow viewers to do this. Evelyn Posamienter travels metaphorically through European history and her speaker’s personal past in her poetry, with scenes of old age, lonely childhood and insecurity alongside creeping continents and crumbling cities. Finally, debut author P.B. 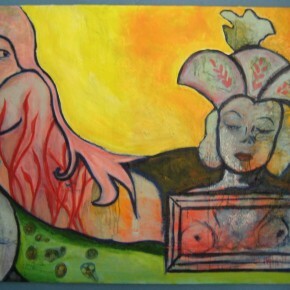 Gookenschleim, the ‘Lunch Lady’ returns to the grand scheme of things in her work, Beanum Infinitum. Reviewed here by staff writer Sarah Melton, the book poses existential questions about our place in the universe through the short illustrated tale of Beanitrio, one talking bean alone in the cosmos. Reading this month’s issue can remind us that we are not alone in the universe. Others, from different times and places, have raised similar questions about our purpose and destiny, and have expressed themselves and sought to understand the world through science, art and writing. Please enjoy this issue, and join us in celebrating five years! Clyde is highly intelligent in addition to being very creative. 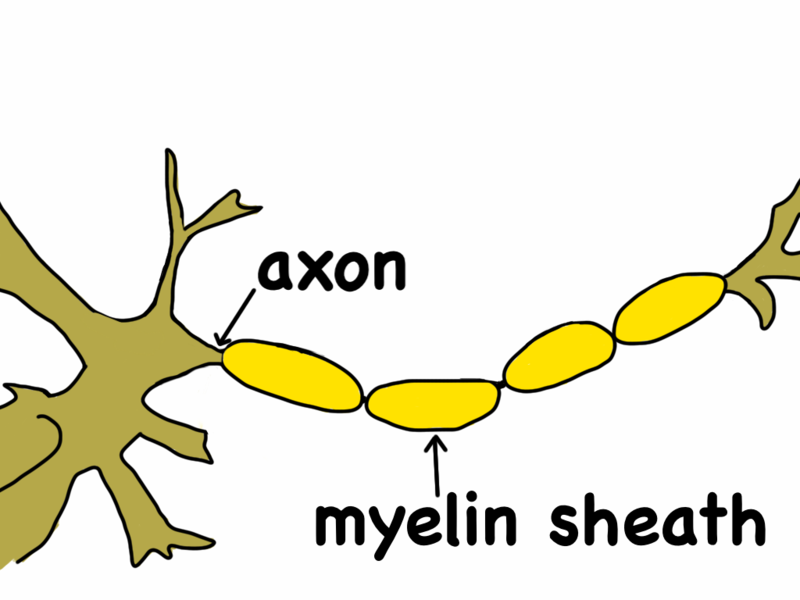 So, this means that he has thick white matter in the IQ areas and thinner white matter in the creativity processing neurons. But there’s more to creativity than just the white matter. 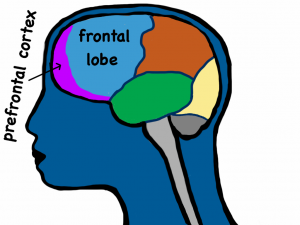 According to Jung, the prefrontal cortex, the brain’s planning and control center, takes a break when the mind is experiencing a creative moment. This clarifies how Clyde often forgets about practical matters when his mind switches to a creative mode. It also explains his ability to be playful without the pre-frontal cortex putting brakes on his uninhibited ability to have fun. The premise of “Beanum Infinitum” is a unique and fascinating idea – to explain the basic concepts of existentialism, with references to advanced physics and astronomy and a sprinkling of absurdist humor throughout – and all in the format of a whimsical childrens book. While some aspects of the total creation are flawed, those who take the time to read this unique piece of literature may find it to be “A Legume in the Rough”. A couple of things the reader will want to know before purchasing and/or reading this book on Amazon. First, while this story is in a44-page childrens book format, it is not a book for young children. Or at least, not for children whose parents would mind reading the f-word occasionally interjected at somewhat random moments. Also, while the book is available as a self-published finished work via AuthorHouse, the author describes it as “more of a promotional issue”, which explains the intermixed pencil drawings and hand-written side notes alongside the cleaner-formatted text and color illustrations. I would love to see this book re-imagined with a professional illustrator, for while the penciled-in doodles seemed to serve as more of a distraction than a descriptor of the story, you could also easily see what the author was portraying. That being said, the premise itself was unique and engaging. A story within a story, an ancient storyteller spins the tale of Beanitrio, a tiny sentient pinto bean living on the planet Refry (in the Charro Way Galaxy – sensing a theme yet? 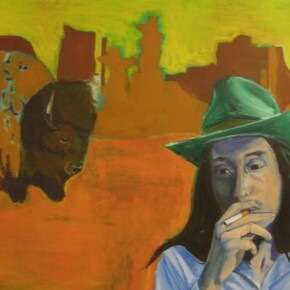 ), who is coming to terms with his own self-awareness and the world around him. His journey of discovery grew, as he discovered more each day about the world, the galaxy, the universe around him. His emotions ran wild with each new revelation, from joy and excitement to loneliness and desperation. Then, as the mysteries of “How” unfolded, the ever-looming question of “Why?” was revisited time and time again as he struggled to find his purpose and place in his strange and wondrous surroundings. On a personal level, it almost felt as if there were two people writing the book – like the majority was painstakingly penned by a learned, highly intelligent and introspective philosopher, but with a nine year old child with a head full of poo and fart jokes (the kind that said child is convinced will NEVER get old) looking over their shoulder and interjecting his/her two cents every so often. Sometimes this combination serves to add a little levity to an otherwise deep and intense existential dilemma – but more often it’s an unwanted (by this reader, at least) detraction from the flow of the prose and substance that kept it truly interesting. 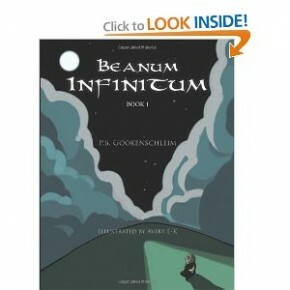 All in all, “Beanum Infinitum: Book 1” is definitely worth a look for those wanting to dip their toes into the realm of existential philosophy without any of the stuffiness or forced intellectualism that sometimes runs hand in hand with it. It’s definitely among the more ‘especial’ tales out there, and leaves the reader wondering what situations could possibly be in store next when Book 2 hits the shelves. Part IV: Concerning the narrator’s final days on the world’s third-largest island and the psychological damage of departure. There are little things that I wanted to remember, things that I’m slowly forgetting. It’s the small, seemingly inconsequential anecdotes that make a story. As time goes by the plot, the characters, the setting all fade and grey, but the chance encounters, the spontaneous decisions, the sudden downpours, stay clear in the mind. The mundane trumps the monumental. And so I must commit these anecdotal happenings to word, put pen to paper (so to speak), and archive them in the deep recesses of my mind (and hard drive). I will remember the ants: learning to live in harmony with them, accepting their inevitability, and respecting their place here. Even now, I feel a tingling sensation as an ant – a tiny, red ant (though not a fire ant) – navigates my thigh. I will remember the rain: the intensity and unexpectedness of it, the power of the heavens. It’s raining now, the wet skies keeping me inside, but this isn’t a bad thing. I need the time to write and edit and think. So I thank the rain for that. Last night we drove to Siniawan, a small village near Bau that is known for its twice-weekly night market (Friday and Saturday, beginning at nightfall). Really it’s just one street, lined with old storefronts that have remained unchanged since their construction. The buildings along the road are wooden, most of them unpainted, with shutters, and balconies. Lonely Planet would use words like ‘vintage’ or ‘heritage’ to describe Siniawan, but that would be putting a touristic filter on a village that is far simpler. There is no pretence, no attempt at drawing tourists, no affectation. Siniawan is unchanged because the people left the village when it became too small. The storefronts retain their original wood because it would be too expensive to update them. If someone had the money to renovate the buildings – to plaster and repaint them – it would be done in a second. The locals who visit the night market, don’t pay any attention to the ‘heritage’ buildings or their ‘vintage’ façade, but it is a festive place. Red Chinese lanterns are strung up between the buildings, over the street, year-round so there’s a constant sense of celebration. And every Friday and Saturday night the ultimate sign of Bornean festivity, a karaoke machine, is rigged up on a central stage. When we arrive at seven in the evening, the street is mostly empty. We meet Enid and Carl, two older New Zealanders who love to talk, can’t seem to listen, and have that geriatric sensibility that makes everything they say sound a little bit racist: “You know how these people are” and “I wish these people would learn how to cook a fish properly.” Wandering down the street we come to a Chinese temple where a group of teenagers are practicing a dragon dance. They’re dressed in traditional garb and some of them play the drums and gongs while others shake and writhe in a dragon costume. Chinese New Year is right around the corner (February 10th); the holiday completely dwarfs the Western New Year, and is perhaps the largest celebration in Borneo. Young kids race by on bicycles, waving sparklers, lighting up the night. I hear the sound of a firecracker going off, but can’t see it. The stars are bright, but not as interesting as the red lanterns. We make our way to a table – the street is roped off to traffic, and filled with tables in front of various cafes and food stalls – and order some food. I choose a black pepper chicken dish from a stall (essentially a wok on the street), and the others order stingray from a man with nicotine-stained teeth. He smokes as he cooks, but then again, everyone smokes here. I’ve never encountered so much smoking in my life. A pack of cigarettes (20) costs roughly ten ringgits: that’s four New Zealander dollars. Smoking is not banned anywhere, it’s almost encouraged. Men smoke behind the counter of hardware stores, women smoke as they fry noodles. A few days ago at the public pool, a man smoked as he showered, scattering ashes down the drain. Smoke while you drive, while you shave, while you shower, while you eat, while you sleep. Smoke to stave off boredom, smoke to forget about the heat and humidity. The teeth here are terrible; rotting teeth are as common as ashtrays. But the strength of the Malaysian economy shouldn’t be underestimated. Yes, there is some poverty and poor dental hygiene, but the majority of people seem to have some kind of employment. I’ve only encountered a handful of beggars, and there’s enough consumer purchasing power to support the dozens of shops that fill every town. There’s an open drain in front of our house, and it attracts dragonflies of fantastic colours. Something ugly and something beautiful, coexisting. It’s like a lot of Borneo, the ugliness and beauty sharing the island: derelict housing estates in front of rich jungle, piles of rubbish on stunning beaches, faceless hyper-malls alongside vibrant fruit markets… open drains and dragonflies. The departure tunnel, connecting Gate 9 to AirAsia Flight AK1775 is dark. The air is cool and stale, there’s no indication of the humidity outside. I’m walking from one life to another; from the wild, to the West; from the unknown, to home; from Borneo to New Zealand. I’ve been on this island for two months, and I still don’t know what to think about my travels here, about living here. In some ways it has all left a bitter taste in my mouth: seeing the development, the environmental degradation, the collapsing ecosystem. While there’s been beauty and thrill, there’s been a lot of frustration. Frustration at the carelessness of locals, at the blindness of tourists. We drive down a stretch of road, through the jungle, and watch as another hyper-mall is erected. We wander village paths and watch the mass migration to the suburbs. 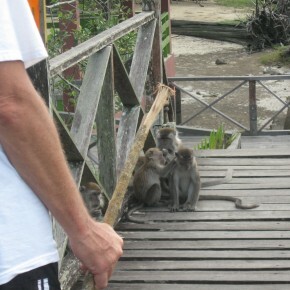 Tour buses connect the dots across Borneo’s ‘hot spots’ and miss the true wonders of the island. What I do know is that my time here with my father has been relationship-defining. This was a bonding experience that will never happen again. And through thick and thin, through absence and silence, we will always have Borneo. Whether it be eating at SCR three times a week, drinking a root beer float and watching the sun go down, exploring the winding streets of Kuching, wandering around Giant and enjoying Upin & Ipin – the moments I will remember most from this trip are some of the more mundane experiences we shared. Yes, the ‘touristic’ experiences were impressive: seeing orangutans, snorkelling off the coast of KK, hiking in the thick rainforest. But it is the domestic adventures that will stay with me: shopping for furniture, eating at local food courts, driving. It’s the little anecdotes that make a trip; these small things that I’m slowly forgetting. So now I sit in seat 11F, alone in my aisle (the flight is almost empty) awaiting arrival in Singapore. I have eight hours and forty-five minutes to enjoy the world’s best airport. I will write. I will finish the things I need to. Until then, I will watch funny things on my screen. and can finally reflect on the past few weeks. The airport is fantastic of course, but it’s still an airport. The toilets still smell like stale urine, the perfume saleswomen still look incredibly bored, the carpet is still patterned in a terribly insulting way. But I like it here. I like most airports: the history-less-ness of the place, the transience of the people – the mixture of anticipation and sadness, for new places ahead and loved ones left behind. In the morning I write, and then we eat. Bombay Recipe, our saving grace in Padawan. Fauziah and Anwar; fresh lime with ice, sugar but not salt; dua roti kosong, dhal, nasi biriani. The food is good, not great, but consistently good. Surrounded by food courts that sell syrupy juice and seriously erratic noodles (sometimes delicious, mostly greasy), a consistent, dependable restaurant is a lifesaver. We drive to Sentosa and shop for hardware and kitchenware and Hawaiian shirts. At Shalom, a bundle store, I buy a necktie with James Dean’s face all over it. These are the kinds of things that putihs do. We eat dinner at SCR (Singapore Chicken Rice) for the third time this week. The chain restaurant is housed within the Giant complex, and we choose a booth in the back and fill out an order form. It’s a strange place SCR: it’s a chain and bears the usual signs of homogenized ethnic cuisine, but the food is prepared fresh and the presentation is tasteful. The food’s surprisingly excellent. We sit beneath harsh, neon lighting and wait to be served. Though there are six employees standing by the door, we’re ignored for a good ten minutes. We hand over the order form, and the woman eyes it suspiciously. That night I listen to “The End”, sprawled on a faded couch, a ceiling fan slowly spinning above me. I’m going back tomorrow, back to The World. The jungle in front of the house goes up in flames. My bag’s packed, and waiting by the door. Jim Morrison sings louder, the fan spins faster – my last night together in Borneo. Back to The World tomorrow. Sipping water out of a glass gin bottle, the night explodes with John Densmore’s drumroll. It’s a clear night and if you squint you can make out a Greek hunter, club raised, lighting up the heavens. “The west is the best,” Morrison cries, and I’m flying home tomorrow. 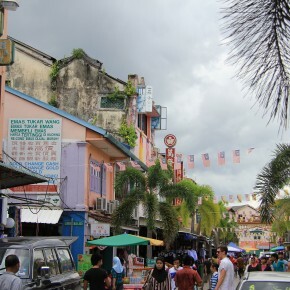 We spend the day in Kuching, exploring the winding streets, taking in the waterfront; the colour of Jalan India, the history and tradition of Jalan Carpenter. We arrive at the planetarium ten minutes before the show is supposed to start, but the theatre is closed for maintenance. Instead, we take a glass elevator to the top of the Civic Centre. It’s the kind of structure that would have been impressive once, but time has bruised its exterior, and the building now looks tired. From the top, it’s a view to kill, even better than the view from the top floor of the Riverside Mall (a building equally as tired, but far brighter). We park at the Sarawak Public Museum – the stuffed animals are embarrassingly rendered, googly-eyes glued onto a flat face. Terrible taxidermy. We eat at Restaurant Jubilee on Jalan India, then walk to the Chinese History Museum to escape the heat. 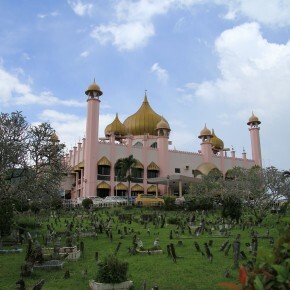 Kuching is a delightful city: accessible, eclectic, revealing a new treasure upon each visit. The grand Buddhist temple at the foot of the Hilton may take centre stage, but it’s the hidden shrine set above Jalan Carpenter (#36) that is the true gem of the city. At night, the waterfront lights up and Kuching feels more Mediterranean than Southeast Asian. The kids, no older than seven, stand up as we walk into the classroom. “Good morning Teacher.” And then when I introduce myself, “Good Morning Mr Lukas.” Most of them speak three languages. “Thank you Mr Lukas” when I help them with a problem. 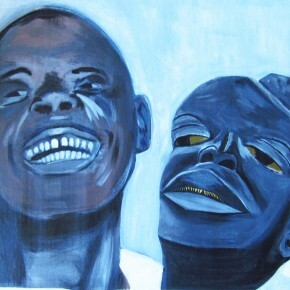 They smile, happy, despite not eating breakfast. Some of them don’t bring any food to school, and the Malaysian government provides a small meal. 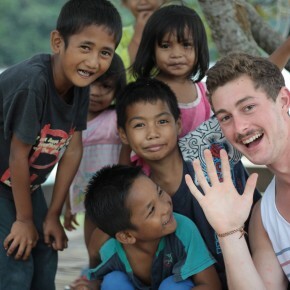 Is it Western imperialism to bring English to a village school, or is it cultural progress? The Muslim girls, in long dresses and headscarves are ostracized from the indigenous Christian kids. They sit alone, or with one another. The fans rarely work, and the classrooms steam up. But there is no complaining, no whining. The bright ones, with bright eyes, are already bored. The teachers struggle with classes of forty. At the Chinese school, the students work with military precision. Self-disciplined. Organized. Determined. The West doesn’t stand a chance. Little events stick out from the routine of life that we easily fell into. Walking around the housing estate for the first and last time. Dogs bark from gated driveways. People eye us suspiciously. We stick out, of course, but not because we’re putihs, but because we’re walking. In the Kampung, these people would’ve walked around, visited each other, strolled in the evening. But here, in this new housing complex, people lock their gates, lock their doors, and watch television. Sitting in a small room with the air-conditioning on. No communication. No community. This is progress. This is ‘the dream.’ Nothing seems real, still. It will all be over before anything makes sense; even then the neon lights will shine from another place, inaccessible to the conscious mind. It’s 2:30 AM and I’m home. Sitting in our lounge, on our fresh-smelling couch. Home. It feels good to be back – good but not entirely normal yet. There seems to be a lag between my eyes and my brain – my retinas and my mind. What I see and what I understand don’t match up. Driving up Patui Avenue, I see the trimmed lawns and blooming gardens of our neighbours, but my head is still in the dark streets of Padawan. In my mind I’m still in the humid night of Borneo, the ceiling fan moving hot air around the small room. The jungle is painted on my eyelids, my skin itches. It’s conflicting, but I know that it will get better as days go by. of clouds & sea. was it you or was it me? a city collapses beneath confetti. turtle dreams shift like you or me. emerge. call god into question. The city of Lisbon makes me have so much to say that I really had a very hard time to decide what I should talk about. I thought about the places and the history, the river and the hills and finally decided to talk to you about the colors of my city, having inside my heart the secret hope to discover the exact things I should tell you in my next letter. Not surprisingly, I had the same problem selecting the photos to present to you. Nevertheless, I selected the photos you can see below. I really believe they portrait the very heart of Lisbon. Ok, some might say, watch out, where is a heart there is blood. But relax, that’s not the case here! When I think about Lisbon I really can’t imagine a day when darkness completely covered the city, even during the winter. This is because the buildings have different colors and some of them are covered with glazed tiles or have a group of glazed tiles to make them more beautiful. This is true for old buildings but also new buildings. The first photo below shows the Tagus River on the left (in Portuguese: Rio Tejo) and blue glazed tiles on the right (in Portuguese: azulejos). The light over the river seems to come from him and not from the sun. In fact, the reflections from the waters in a summer afternoon make me feel a strange feeling: something in between the kiss of a mermaid and the astonishment of a child when he or she first contemplates the blue waters. The dry heat mixed with the blue of river mixed with the yellow of the buildings and the pink of the flowers are something that spreads over the air as a dream misplaced in time. But this city is not only made with yellow buildings. Please look to the second picture bellow. 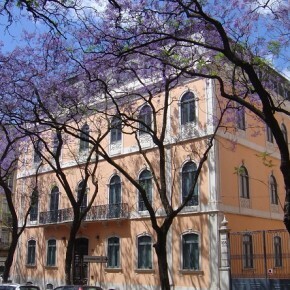 There you can see the strange combination of the violet flowers of this tree, in June, and the color of this 18th century building. Please stare at the photo for a moment. Maybe you are understanding the city the way I did a few years ago… The old city is like a doll house where we can imagine ourselves as citizens of a neighborhood inhabited by real people and real ghosts. And everything in a day of Summer, in June or July, sees us surrounded with the pleasant and white smell of candles just snuffed by a mad person that likes smoke that is wholly and completely nonthreatening. 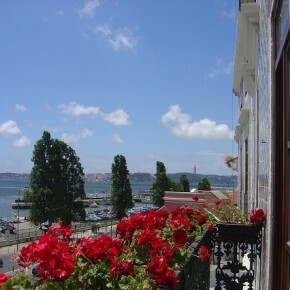 To live in Lisbon and go to the center of Lisbon, to downtown, is like going back in time to the 18th century. Don’t worry, I will explain this to you in my next letter. Now, I gently invite you to stare at the third photo. 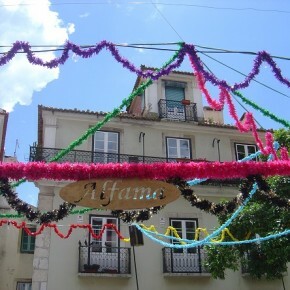 There you can see some colorful ribbons and a peace of wood that says “Alfama”. Alfama is the name of one of the most typical quarters of Lisbon. The ribbons are there because the photo was taken in June during the preparation of the most important party of the city, that takes place in June. Certainly, there’s a Saint involved in this party! Santo António de Lisboa, or Saint António from Lisbon, that is also Saint António from Pádua, in Italy, the city where he died in 13 June 1231. It is believed that this Saint can bring about good weddings and this is great news for you, my friend, because if you want to marry soon you just have to came to Lisbon on 13 June and pray! Yes, if you are in July you must wait all year… That might seem very unfortunate but you can start praying right now! My dear friends, now I have to finish this letter and return to my colorful life, letting you behind, suffering the absence of my next words. You should wait for my next letter… Where I will explain you the recent past of this city. By recent past I mean the 18th century. Rui is an app developer in Lisbon and may be reached at ruiprcar@gmail.com. connection with others, with nature, with our culture and shared history. surrounding me. It is also exciting and fun, something I cannot live without.